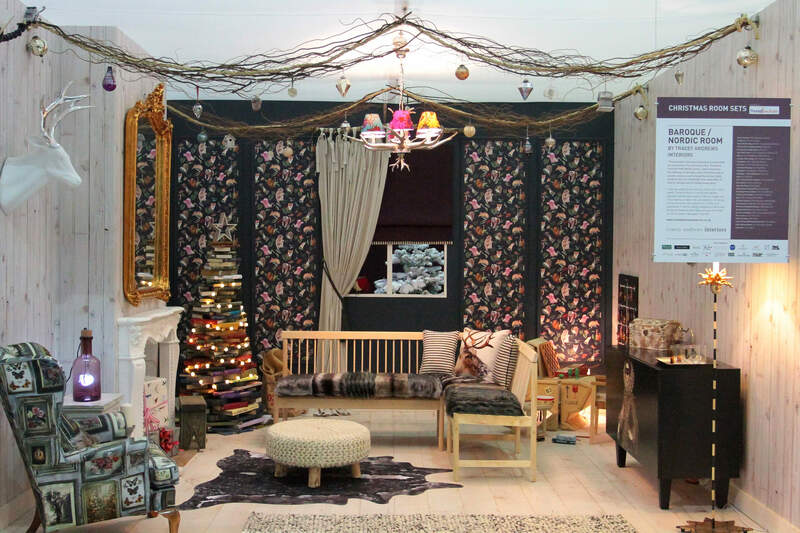 We were delighted to design a Christmas room set for a feature at The Ideal Home Show at Earls Court, 2014. This was the final year and home for the Show and it has now left the site after nearly 100 years. The room set was displayed alongside the work of six other designers. Refreshingly simple with a whimsical air and layered with elements of surprise. The design drives a collision of two opposite styles; the dramatic influence of Baroque with the simplicity of Scandinavian style. Hints of sparkle with soft lighting brought the two together to highlight a celebration of Christmas.. Among the many products we displayed a vintage inspired fabric armchair designed by textile designer Emily Humphrey, wallpaper and framed panels from Rocket St George, and sideboard from the wonderfully talented Mineheart. Floor lamp from Elstead Lighting, exuded playfulness, whilst the oversized packing grate goose from Italian designer, Seletti threw an element of surprise. Visitors loved the lighted feature ‘book’ Christmas tree which was created by ourselves, became the primary focus of attention - widely photographed throughout those exhibiting days.The room sets give licence to let the imagination run wild and all within a three-meter squared space.